Quartz worktops have become the most popular type of solid kitchen worktop. There are a significant number of new homes being built with quartz kitchen worktops. They portray the classic look and call for zero maintenance. Thus, you get the desired look for your kitchen with this one. Quartz has come up as an emerging trend for kitchen worktops and more and more people are preferring it over the other counterparts and there are a number of reasons behind this. Let’s try to explore here why quartz worktop is such a popular choice. Just read on. Quartz Worktops Are Available in a Plethora of Colours and Tones – Here you get a wide range of modern tones and colours that will suit all the taste and preferences. Manufacturers now produce the quartz worktops in a variety of colours from the imitation granite to solid colours that no one can suspect not to be the real thing. 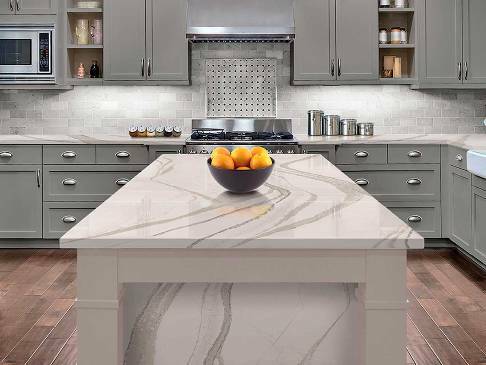 While most of the quartz countertops resemble the smooth and shiny finish it can be much beyond the polished look. For example, you can go for Silestone that provides a volcanic texture for a rustic look and a suede texture with softer feel. Quartz Worktops Are Hassle-free – The quartz worktops are engineered and man-made stone formed from about 90 percent quartz with binders like polymers, resins and various other pigments for the added colour. That is why the quartz materials are resistant to scratches and stains. In terms of the maintenance, this worktop calls for zero upkeep and hence no wax or sealant is required. Since the quartz worktops are non-porous they are the first choice for kitchens. Just keep it in mind that the quartz worktops are intolerant to extreme heat and so if you place on hot pans and pots directly on the worktop then that can damage the surface to a great extent. Quartz Worktops Are Hygienic- The quartz countertops are designed by keeping the users in mind and that is why it is manufactured for being extremely hygienic. Quartz stone works at preventing any growth of bacteria on the surface as a result of which you get a very hygienic worktop for the kitchen. This is a huge bonus on kitchen worktops as you will be preparing food on the surfaces. Quartz Worktops Are Cost-Effective – Just like the other countertops, there can be a little variation in prices. But quartz which is the modern alternative to marble and granite that offers a wider range of styles ranging from budget to luxury. No matter what style you choose, you will also get a sophisticated addition that will look professional wherever you want to install the worktop. Quartz Worktops Make a Great ROI – Quartz costs much less than its natural stone counterparts. Moreover, since these worktops are highly durable they are proven to be much more cost-effective than the others. So even if the upfront cost seems to be higher, the quartz worktops in London will outweigh the others for its great longevity and hassle-free maintenance. The above are some of the major reasons why quartz worktops are so popular worktop over the years and more people are preferring it over the years.